I've been on the prowl for Revlon Whimsical ever since swatches starting popping up on blogs, and the only place I was able to locate it was at Meijer. I love that Revlon is introducing these gorgeous glitter concoctions, and this one is so Spring-like. We even have blue skies and sunshine today, although it's very chilly. I used a base of Misa Little Hands, which is a Tiffany Blue creme shade from their Spring Precious Moments Collection. My glitter placement was sparse after 2 coats, which was a little disappointing, because it looks more condensed in the bottle (below). This is still a lovely polish though, and it makes me happy! 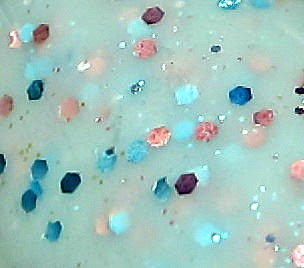 This shade combines pink and blue hex glitter with smaller silver glitter swimming in a milky aqua base. All of the glitters have some color shifting action--the blue and pink glitters shift to a coppery pink, violet, and brighter blue, while the smaller silver glitter takes on a blue green hue. The base is very sheer, which makes it ideal to use over just about any color of base. It will mute your base color, but it won't really alter it too much. So many layering possibilities with this shade! As you probably know, this shade is very close to Deborah Lippmann's Glitter in the Air, only with a much lower price. I'll leave you with this image that caught me by surprise this morning. I bring all of my patio plants indoors during the Winter, and they normally become quite dormant and inactive. By the time it's warm enough to place them outdoors in late April, they look pretty pathetic with barely any leaves, and never any blossoms. I'm always afraid they're going to die before Spring gets here. For some reason, my Presidential Hibiscus is coming to life this week. It's covered in buds, so I should have 7-8 more blossoms in the next couple of days. Maybe a sign of an early Spring? I sure hope so! That's a really pretty combo. 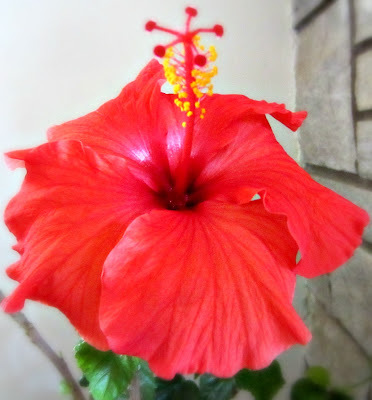 And I love the hibiscus! How wonderful to see that beautiful blossom! Thanks for a touch of Spring to come. Love that polish. It's on my list to buy. I'd much rather buy this than the Debroah Lippmann. I love hibiscus since I grew up in a home that had tons of it.I love that Revlon is coming up with really great colors. I just got Naughty, which is perplex remake.